The large and airy living/dining room with a wooden floor opens onto a large terrace, overlooking the Bay of Angels. There are two very quiet double bedrooms. One is overlooking a Mediterranean garden. The apartment also includes a bathroom, one separated toilet and an equipped separated kitchen with modern appliances. Wonderful location,paneramic views,all amenities and places of interest within walking distance plus all types of transport to resorts and enchanting towns and villages within easy reach. I stayed at the property for 3 months. The location is excellent. The views of the water incredible and on most days a nice breeze off the water. The owners are wonderful and very responsive. I hope to stay there again. The only small drawback is the bathroom that needs some updating. 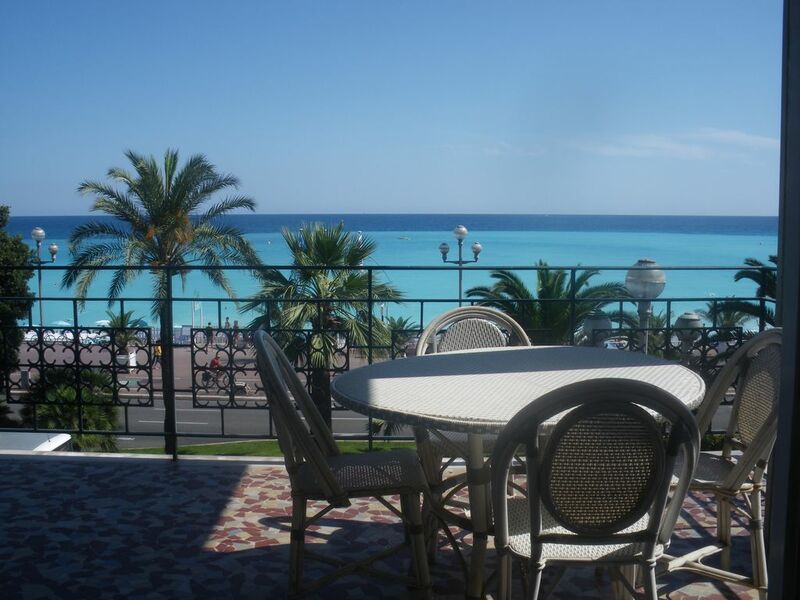 Very comfortable apartment within easy reach of most of La cote d'azure. The owners of the apartment are lovely, kind people. We enjoyed our stay and visited several towns along La Cote D'azure. There are several interesting museums and galleries to see in Nice, Monaco and Monton and there is a very good train service all along the coast with very reasonable fares. The apartment overlooks the sea and all is enhanced by the splendid weather. Had a great time. hosts very friendly and helpful, property spacious and very convenient location. Clean and spacious apartment. Very friendly and helpful hosts: Tiphaine and Ahmed. Bus station right in front of the building. Restaurants and shops very close. Spacious beach front apartment located on the sun drenched Promenade des Anglais, 3 minutes walk from the Negresco Hotel, just steps away from the shopping and restaurants district. If you are coming from a country setting, please keep in mind this apartment is in the center of town.